When most people think of Jeff Foxworthy they think of him as a comedian, actor, author, and occasional game show host. He is probably most known for his line of “You might be a redneck” jokes. I personally wouldn’t consider myself to be a fan of Jeff Foxworthy as his humor doesn’t really appeal to me. When I heard that he designed a board game I was skeptical but decided to try it out since I have always been a big fan of the Apples to Apples genre of party games. Jeff Foxworthy’s Relative Insanity may be far from original but it is one of the better games that I have played in the Apples to Apples genre of party games. We would like to thank PlayMonster for the review copy of Relative Insanity used for this review. Other than receiving the review copy we at Geeky Hobbies received no other compensation. Receiving the review copy had no impact on the content of this review or the final score. Sort the punch line cards (yellow) from the setup cards (red). Shuffle the two sets of cards separately. Place both decks of cards on the table. Deal seven punch line cards to each player. The player who owns the game gets to be the first judge. Each round begins with the judge drawing one of the setup cards and reading it out loud. All of the other players will look through the cards in their hand and choose which one they think works best with the setup card. 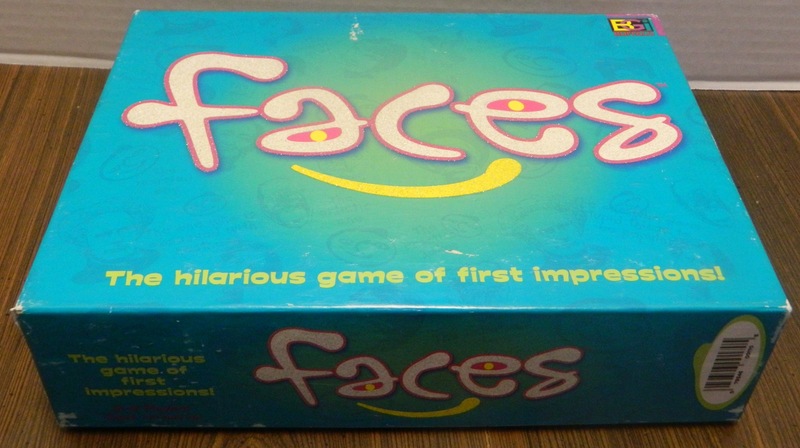 Each player places their chosen card face down on the table. When everyone has played their card, all of the played cards are shuffled. The judge rereads the setup card and then reads aloud all of the punch line cards. The judge will pick which punch line they like the most. The player who played the punch line card gets to keep the setup card which will count as a point. All of the punch line cards used in the round are discarded. Each player who played a card gets to draw a new punch line card from the draw pile. The next player to the left becomes the judge in the next round. The first player to collect five setup cards wins the game. This player has collected five setup cards so they have won the game. 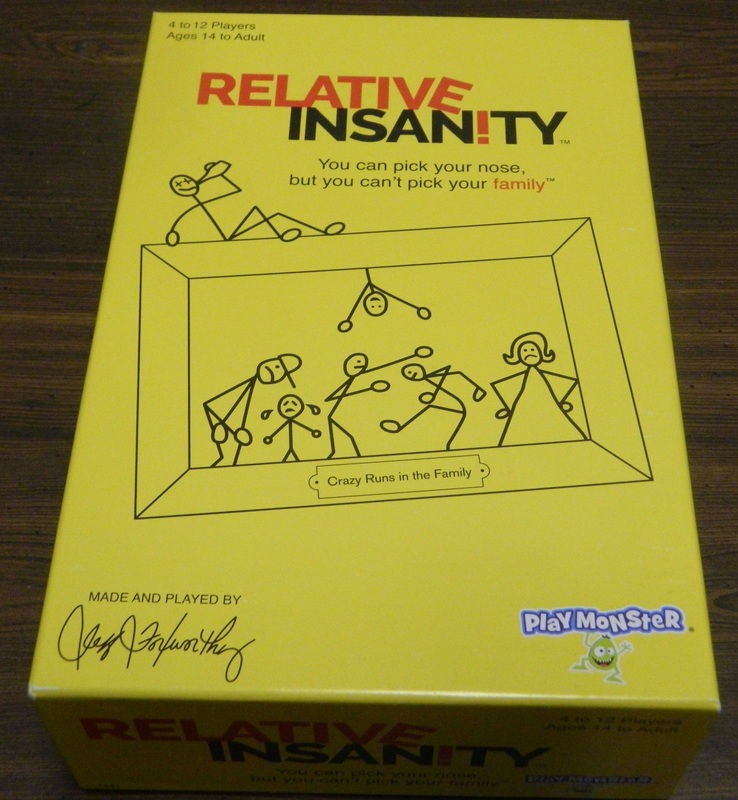 I am going to get right to the point and say that Relative Insanity is not an original game. If you have ever played Apples to Apples, Cards Against Humanity or one of the many other games to come out of this genre; you should already have a good idea of how Relative Insanity plays. One player acts as the judge and draws a prompt. The rest of the players have to play a card that they think works the best for prompt. The judge chooses which one they like the most. Rinse and repeat until someone has won five rounds. If this sounds familiar it should since Relative Insanity brings no original mechanics to the genre. When you combine the lack of originality with the fact that I have never been a big fan of Jeff Foxworthy’s comedy, I have to admit I didn’t have high expectations for Relative Insanity. Despite these two issues I will gladly admit that I was pleasantly surprised by Relative Insanity. I am not a fan of Jeff Foxworthy’s comedy but it actually works really well for this type of game. The idea of the prompt being a setup for a joke that the other players have to finish is a clever way of utilizing the mechanic of everyone playing a card for the judge. The thing that usually either makes or breaks a game in this genre is whether the two sets of cards work well together. If these cards don’t work well together, the game will suffer as there will be too many rounds that drag where none of the answers work well. I am happy to say that Relative Insanity does better than most games in this area. There will be occasional instances where you don’t have a card that really applies to the setup card but you usually will have at least one that works even if it is not all that funny. While there are rounds where there is clearly one superior answer, I was surprised by the number of rounds that actually had several strong answers. I think this is a testament to how well the two sets of cards work together. The other area where Relative Insanity impressed me was that it was funnier than I expected. Not being a fan of Jeff Foxworthy’s humor I didn’t think the game was going to be that funny. While a lot of the setups are for “redneck” jokes (which I don’t really care for), there were actually a lot of times where players were able to find cards that lead players to laughing out loud. I was genuinely surprised by how well the humor worked in the game. I think most of the humor in the game came from two things. First the game has quite a few cards which have some really random sayings that can be funny in any situation. There were also a lot of times where players were able to find the absolute perfect card for a situation. If you absolutely hate Jeff Foxworthy’s humor you probably still won’t find the game to be very funny. If you are kind of indifferent to his humor though (like me), you might be surprised by how many laughs you can get out of Relative Insanity. While this is easily fixed, I don’t know if I agree with players only needing five cards to win the game. If you are playing with quite a few players this isn’t going to be a problem but the game is too short if you are only playing with four or five players. We played the game with four players and if we would have only played to five cards the game probably would have only took around 20 minutes. We decided to increase the number of cards to ten and the game then took around an hour to complete. I wouldn’t really consider this to be an issue though since players can easily choose to play to as many cards as they want. As long as players decide on how many cards before starting the game, it makes no difference on the actual gameplay. On the spectrum between Apples to Apples (family friendly) to Cards Against Humanity (adults only), I would put Relative Insanity somewhere in the middle. Basically if I were to give it a rating I would probably give it a PG-13 rating. The game has some light to moderate sexual innuendo (references to body parts) on some cards and some of the cards have some lesser swear words like a**, h*ll, cr*p, etc. I personally wouldn’t recommend playing the game with children but I don’t see a lot of issues playing the game with teenagers. While the game is never going to be as raunchy as Cards Against Humanity, if you are playing the game with just adults the cards do allow players to make the game dirtier than it is on the surface. A while back I looked at The Big Bang Theory The Party Game which was another game that tried to balance between family friendly and adults only. 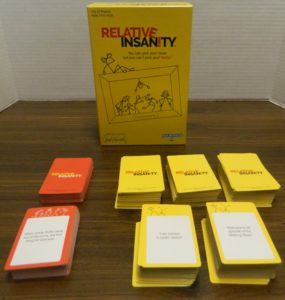 While the Big Bang Theory Party Game did a poor job trying to balance both extremes, I actually think Relative Insanity does a pretty good job. If you are into games like Cards Against Humanity it will probably be too “tame” for you. For people that think Cards Against Humanity is too raunchy, I think it is the right middle ground. Like with most of these games that we have played in the past, we once again decided to try out the random player house rule that we came up with a long time ago. For those of you who are unfamiliar with the house rule, we basically randomly add an additional card to the cards submitted for each prompt. This gives the judge another option to choose from which is usually a good thing when you are playing one of these type of games without a lot of players. The reason that we have always liked this house rule is that it almost always brings something interesting to the game. In some games the random player actually does really well. The random player has almost won in some games. In other situations it adds a lot of humor to the game as the answer is so out of left field that you can’t avoid laughing out loud. In the case of Relative Insanity the answers given by the random player actually worked well for the most part. The random player didn’t do that well in the game though. Relative Insanity basically gives you what you would expect with regards to the components. All you get is a bunch of cards. The artwork is not bad but the cards are pretty simplistic. The card quality is solid but are a little too thin which sometimes makes them hard to pick up from the table. With these type of games what matters most is the quantity of cards and I would say that Relative Insanity does a pretty good job in this area. The game comes with 400 punch line cards and 100 setup cards. Some of the setup cards give you similar prompts but you really can’t ask for more with regards to the quantity of prompts. 400 punch line cards give you a lot of options as well. You will eventually have to reuse cards but the odds of repeating a joke are not particularly high. Should You Buy Relative Insanity? I have to say that I was pleasantly surprised by Relative Insanity. Relative Insanity doesn’t bring any new mechanics to the genre but it is still one of the better games that I have played in this genre. A lot of this has to do with the cards actually working really well together. Rarely will there be a round where there are no good responses. 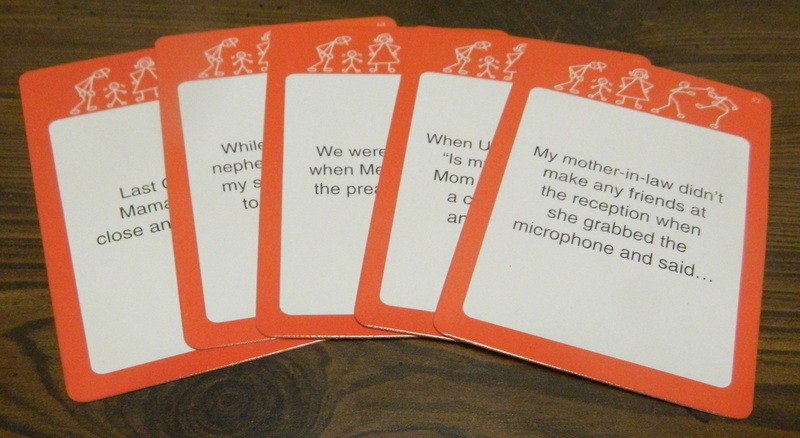 The cards are well designed so it is easy for the players to come up with funny jokes. The game also does a good job finding a happy medium between family friendly games like Apples to Apples and adults only games like Cards Against Humanity. If you have never been a fan of these type of party games, Relative Insanity is not going to change your mind. If you hate Jeff Foxworthy’s comedy, it also may not be for you. Otherwise I would give Relative Insanity a chance because it is actually quite a bit better than I was expecting. If you are looking for a teen/adult party game, I think you can enjoy your time with Relative Insanity. When he does can you notify me so I can purchase ASAP? At this time there is no expansion for the game. Generally expansion packs come out within a year or two of the game originally coming out and since Relative Insanity came out last year I would expect an expansion to come out soon if there was going to be one. Whether the game gets an expansion is going to come down to whether the game sells well. As the game seems to be getting buzz lately I would guess the game would eventually get an expansion. If an expansion gets announced I will try to let you know. In the meantime quite a few games have the same gameplay as Relative Insanity if you were interested in trying out a different game. Some games I would recommend checking out would include Apples to Apples, Faces, The Game of Things, Mad Libs the Card Game, and Snake Oil. If you are looking for a game considerably more adult than Relative Insanity I would probably recommend Cards Against Humanity (Amazon ). Just played this game with my husband’s side pf the family. We had a ball! I always seemed to get the perfect answer to the one we just did though. The cards work surprisingly well for this type of game. You can have some laugh out loud moments with the game. 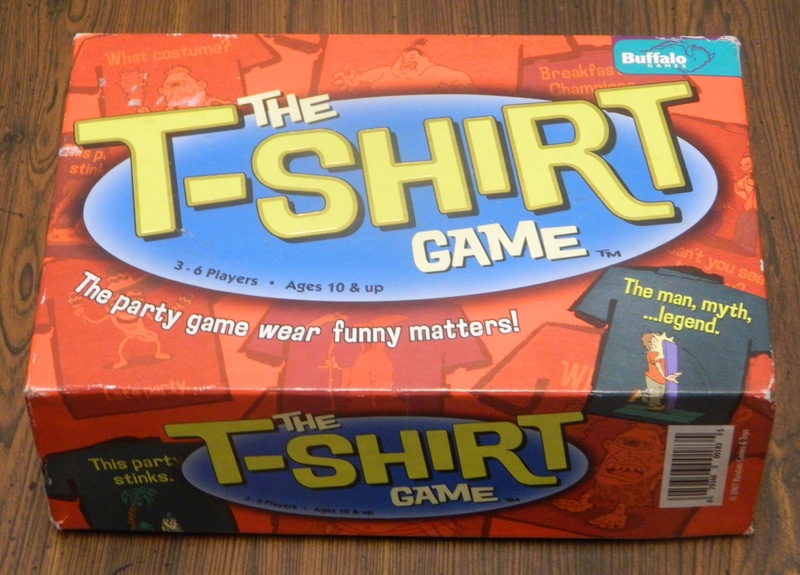 Outside of Jeff Foxworthy's humor, the game adds nothing new to the genre. May not appeal to people who hate Jeff Foxworthy's humor.